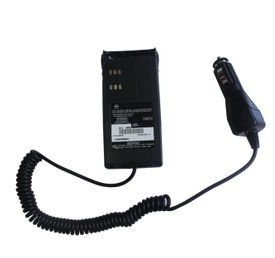 CBE-9008 : Battery Eliminator for MOTOROLA handheld radios. Enables high-watt operation of HT from a 12-13.8VDC socket. Fits the following radios models: STX2500, HT750, ATS2500, GP1280, GP140, GP240, GP280, GP320, GP328, GP338, GP339, GP340, GP344, GP360, GP380, MT750, GP388, GP540, GP580, GP640, GP680, GP688, HT1225, HT1250, HT1250LS, HT1550, HT1550XLS, MT8250, MT8250LS, MTX8250, MTX8250XLS, MTX850, MTX850LS, MTX900, MTX9250, MTX950, MTX960, PR860, PRO5150, PRO5350, PRO5450, PRO5550, PRO5750. PRO7150, PRO7350, PRO7750, PRO9150, PTX700, PTX760, PTX780, Waris, Waris 1250, Waris 1550, Waris HT750, etc. 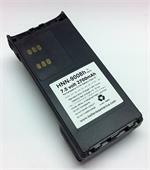 Replaces original batteries such as NTN9008, NTN9008A, NTN9009, NTN9009A, NTN9009B, etc. HNN9009 : 7.5 volt 1650mAh NiMH battery for GP320, HT750, PRO5150 etc. HNN9009: 7.5 volt 1650mAh long-life rechargeable Ni-MH battery; fits Motorola GP1280, GP320, GP328, GP338, GP340, HT1250, HT750, MTX900, PRO 5150, Waris, etc. Replaces original # HNN9008 etc. Charging contacts on back are about 1/4" from bottom. HNN9008h : 7.5 volt 2700mAh long life NiMH battery for Motorola XTS-2500 etc. HNN9008 : 7.5 volt 2700mAh LONG LIFE rechargeable Ni-MH battery for Motorola XTS2500, XTS1500, PR1500, MT1500, etc. Replaces Motorola part # NTN9858 and others. Charging contacts on the back are about 3/4" up from the back of battery.